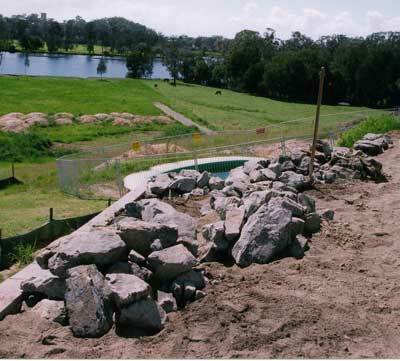 Materials for artificial rock and faux garden boulders is the most cost effective and easiest way to landscape with rock boulders and allowing you to make custom fake rock designs with methods of synthetic and artificial stone rock making. 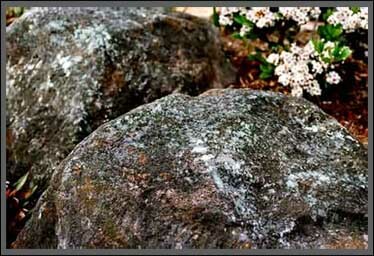 For landscapers home gardeners and home improvers this artificial rock method is a versatile and an extremely effective entry point into getting started making your own incredibly realistic faux rock and fake rock. Using our recipes for artificial rocks. Its basic design is by utilizing recycled products such as building rubble to create solid mounds with concrete then poured over the mounds as a fastener and a rock making mortar surface then placed over the concrete to shape and texture into a very realistic boulder or boulders. I have used other mounding materials when building rubble has been unavailable such as…small pieces of quarry rock, road base loosely mixed with neat cement, glass bottles and soil fill. The idea of using these materials is that it keeps the cost of hand making your own solid fake rock way down and an unbeatable alternative. At the time of writing the average cost of a 3ftx3ft or .75x.75cm handmade boulder will cost around $40.00aud and once you know how you can make as many artificial rock features as you like. This fake rock technique is the one you can use to make your own unique artificial rock staircases, step treads and stepping stones, fake stone ponds and water surrounds and artificial rock waterfalls, fake boulder gardens and really, so many individual creations that can redefine the way you look at your current and future garden designs. You wont need expensive tools nor materials to get finishes like this. This photo shows in close up detail just how realistic a fake rock surface can be with the help of a few layers of sand coloring and some household acrylic paint. 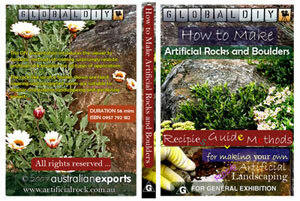 Do it Yourself Artificial Rocks has never been easier you can do it! Our DVD series takes you Step by Step through each process in a lay back easy to follow way that makes it fun for all. Make it Please Don’t Take it! Save thousands of dollars on your backyard Landscape Around 1/4 of the price of real rock. This is the start of an artificial rock boulder garden. The boulders are set out so as to retain a narrowing sloping area that ” falls ” down to an existing masonry block wall. The mounds for these future feature garden boulders are made up of quarried stone purchased from the local landscape yard. 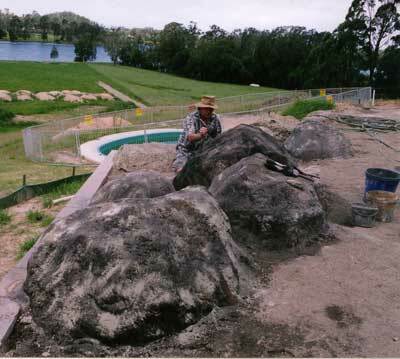 By a home rock makers hand a fake rockery starts to take shape. Each boulder is made individually without the need for prefab moulds and are strategically placed to retain on two levels and lift what could be a boring narrow space. Two months after the completion of this now very impressive and functional garden space the combination of the natural looking albeit fake large rocks and plantings are beginning to meld into a lovely combination. Imagine yourself building something like this. 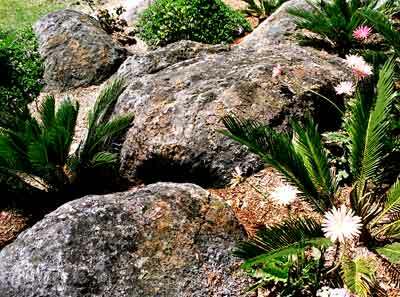 The ultimate handcrafted rockery on a limited budget. Concrete rock is the answer.